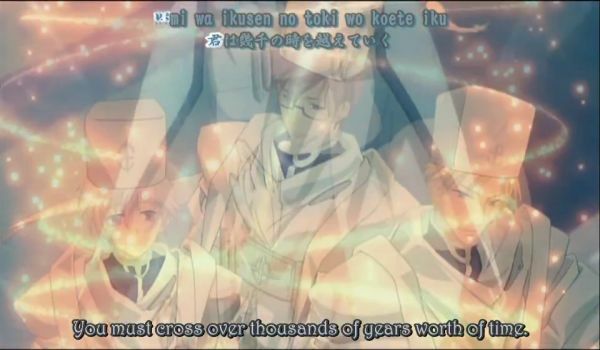 Mood-setting screenshot from the mostly unrelated anime 07 Ghost, where a song says (approximately): “You must cross over thousands of years worth of time.” Luckily, being immortal does not require you not to die. You just have to live eternally while you are alive, but that is more than hard enough. At least you don’t need to do it alone. I distinctly remember writing this before, but I cannot find it with the in-journal search function, Google web or Google desktop. So just in case, I will say all the words that should be spoken, before they are lost forever. I have earlier said that spiritual practice (such as meditation, deep prayer, chanting, lectio divina, keeping the Sabbath etc) all cause expansion of the Now. Obviously we all live only in the now, since we cannot move our bodies in the past or the future with all our willpower. But at the same time, our mind is constantly visiting the past and the future; and more than that, many alternate pasts and futures. This is useful but also dangerous, as we get spread so thin that the actual, real Now may get too little attention. The expansion of the Now is of course utterly subjective. We still have only 24 hours a day, no matter what. The difference is how we experience those hours and what we accomplish during those hours. So if you define science as something that can be measured with instruments, then this is not scientific at all. But it is scientific in the sense that it is repeatable and can be peer-reviewed. If you do roughly the same thing, you will get roughly the same results. One aspect of what I call “spiritual aperture science” is that when the Now is dilated (expanded, made wider, giving more room) it becomes filled with eternity, which flows into time through the opening that is Now. Again, you don’t need to believe this. All you need to do is never set aside any serious time for any kind of spiritual practice, and you are almost guaranteed to never experience any of this. In fact, it will look utterly insane to you, probably. This is as it should be. You have chosen to have no part in eternity in this life. I will not predict what happens when this life is over. I don’t remember anything of the afterlife or the beforelife. What I know about eternity is from this life. And in this life, eternity is only present in the Now. The deeper and wider the Now, the more eternity flows into it. This, of course, is analogous to the influx of Light in my Lightwielder stories. It depends on practice and the absence of that which is contrary to it. But the real thing has another aspect again. This is the other people who lived in eternity before you. They are still there, because eternity never ends. Did he really say that? I am not sure. I have looked for it on Google, but found no trace of it. I remember it quite clearly, and how similar it was to the famous proverb “When the student is ready, the teacher will appear.” (Also: “When the disciple is ready, the Master will appear” and any combination of these two.) Perhaps I dreamed it, or perhaps I saw it in the MMORPG which is based on Daoist legend. I know that whether I actually read those words or not, they had a big impact on my life. Not so much as once, more like one of those depth charges that sink down and then go BOOM a while later. But that is the thing with me and Lao-Tzu. Even if he never said that while alive (and I am still not sure he didn’t), he certainly said it to me. And I have still only a quite small bubble of Now / Eternity, but evidently enough that I can verify by experience that the immortals (eternals) are still there and present in a much more direct way than from the surface of fleeting time. Also, they will find you. You cannot decide who will speak to you, well at least not in the beginning, I am not sure later. But at first they will find you. The place where I imagine I read that particular quote compared the immortals to angels. (I know that this was before I had heard of Kofuku-no-Kagaku and their tendency to use the words “angel” and “bodhisattva” interchangeably, whereas the obvious translation of “bodhisattva” would be “saint”.) In fact, the veneration of saints in Catholic tradition is clearly related to this effect. It is not a worship (although it will be if you have no idea what is going on and just try to pray to saints as if they were pagan demigods). Rather, at some point one of the saints will come alive to you, to the point where you may well have conversations, or at least certainly know how they felt. There are no doubt specific rules, or laws of nature in the timeless domain, that decide which nonlocal operators are taking your calls. I don’t know those rules. If I ever find out, I will tell, unless I am ordered not to. Probably I won’t be ordered that way, however. The secret protects itself. Even now, if you read this and you have not dilated your Now, you won’t make heads or tails of it. Conversely, when I read people who have this experience, even if I don’t agree with them in everything, even if I disagree strongly with them on some things, I can recognize them as soon as I catch a glimpse of this happening to them. They may express it in completely different ways, of course. It will be misunderstood in different ways depending on how you express it. But it will be understood rightly in only one way, because the Now of eternity is one. -Most people have minds that run all over time, including imaginary time. -Traditional spiritual practices cause subjective time to change, expanding the timeless Now. -This causes a subjective experience of eternity that fills this Now. This has a number of effects. -One effect is a heightened awareness of others who live the same way. -Many of those people are long dead. -To the extent that they lived in the eternal Now while alive, they still remain there. Is that clear? Or should I just write about the weather again? This entry was posted in human mind, philosophy, religion by itlandm. Bookmark the permalink.